Anyone got any photos of the old green trams that I can post on the site? I KNOW I took a bunch, but I have no idea what happened to them. I don't even seem to have any photos of the new ones, and I know I posted photos of them at some point. I'm also wondering if anyone here remembers any of the finer details about them, like when they were introduced or when the butane conversion happened. 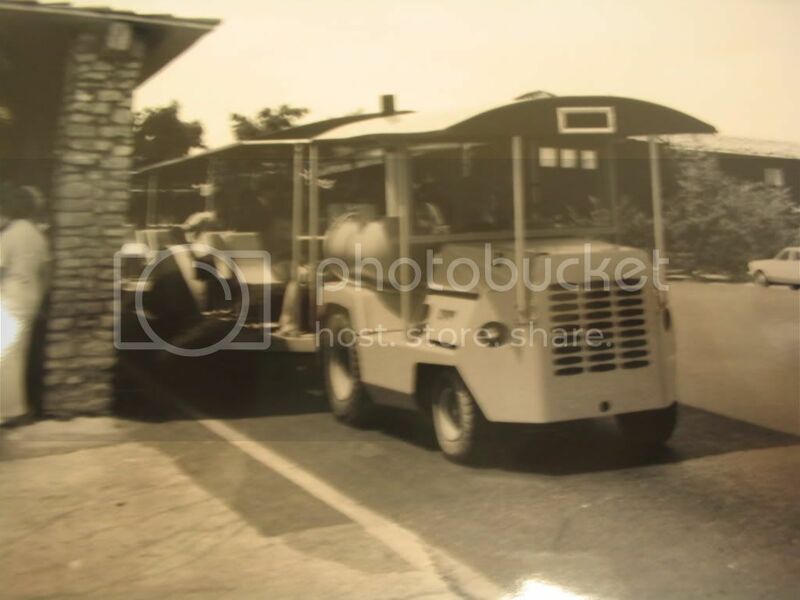 And why we're on the topic, anyone remember the old trolleys? I always groaned at the time when we got stuck with a trolley instead of the cool green trams, but in retrospect they were pretty nostalgic as well in comparison to the modern busses and trams. Seems strange to me that they were taken out at the same time as the trams eve though they were able to handle the inclines. Did they have access issues as well, or were they just old and the park wanted an all-modern fleet? This definitely isn't one of those situations where I'm complaining about the progress though, SDC's shuttle service to the gate is easily one of the top FREE premium services of any theme park in the world, and they still don't get enough credit for it. Six Flags is charging at least $20 to park at a lot of their properties, and many of them don't even have trams unless you are literally miles away from the gate. Not to start SF bashing, but at SFMM we waited and waited for a tram......that never came, we started to walk to the entrance and by the time we arrived we were already hurting. Imagine parking at the SDC employee lot by Fireman's Landing, then walking around the park to the SDC entrance (SF thinks that distance is perfectly acceptable and willing to charge you $20 bucks too). So yes, I completely agree with you, SDC's parking and trams are really awesome!!!!! I just don't have any SDC tram pictures to share, sorry. I don't have any pics, but I wish I did. I loved those trams - so much easier to enter and exit than the new ones. The new ones are not good for strollers and wheelchairs. Trams posted in the last couple of weeks and mentioned how busy she has been with school. Wasn't her avatar a pic of the green trams? sorry, pic dont look that great. I still wonder, why did someone choose that awful color of green? There was a time up until the mid to late 80s when there were employees who worked on the SDC side of the grounds who were 1880s citizens, dressed in costume, and employees who worked in the cave and parking lot who were dressed in a uniform who worked in Marvel Cave Park. The uniformed employees had kind of a state park ranger look, and the cave waiting area and ticket booths, and the parking lot trams were part of this natural, state park type of thing they had going on. Why are the trams green, my guess is it was the closest thing to that state park look. The dividing line between SDC citizen and Marvel Cave Park was the Hospitality House. They offered guided tours for first time SDC visitors for a few years in the mid 70s to mid 80s, and they also wore the uniform. Very seldom during that period would you see a SDC citizen go past the little stage area on the Marvel Cave Park side of the Hospitality House. We worked a greeting line there in the mornings and afternoons. The PTB wanted that zone between the turnstyles and the HH entrance to be sort of a time tunnel passage to the 1880 SDC on the other side of the HH doors. In fact in that period the park won some kind of major theme park award for having a unique entry way to the park. Imagine how surprised and disappointed I was in the 1990s when I returned to the park after many years and discovered they built those little structures for selling Showboat and Grand Palace and Dixie Stampede tickets, and season passes...but the biggest let down was to see Eva and Delilahs bakery there. I wish all you younger folk could have seen that area before construction. I admit, everytime on park I stop for a big iced cinnamon roll and drink, but I miss that clear dividind line between SDC and Marvel Cave Park. I too miss the trams, but with all things, time marches on. It is an awful green, but I love it anyway. Years ago, I made a wrong turn and ended up on the tram trail with no where to turn off all the way to the gate. The guy in the tram ahead of me kept cracking jokes about me. I was so embarrassed, but it was funny! I was really glad when that ride was over...but then as we were at the Homestead listening to a story someone recognized me and told the story of this crazy lady that followed the tram! All done in good taste! The PTB wanted that zone between the turnstyles and the HH entrance to be sort of a time tunnel passage to the 1880 SDC on the other side of the HH doors. In fact in that period the park won some kind of major theme park award for having a unique entry way to the park. I remember this and it was effective. Much life the trees that encroached on 76 as you were near SOTH and the rest of the way to SDC. Gave you the feeling of going " deeper". Interesting you brought up the costumed employees not crossing the line of the HH area. I am aware of the back way to travel from the corner of the HH to the front ticket booths by way of the path that leads around the right side of the cave entrance. Was this started to reinforce this " timeline"?. The same awful green colored trams were used at the Ozark Folk Center Park in Mountain View AR. I think they got rid of them around 2005 or so. Mhguy77 That I think is just another exit from the building for employees...I think utilitarian purposes more than theme.